Cereus is indeed a strange plant, known as the ‘Queen of the Night’ or ‘ Deer Horn Cactus’. So simply put the plant blooms at night, so this is the ‘Night Blooming Cactus’ a novel approach at naming a plant. 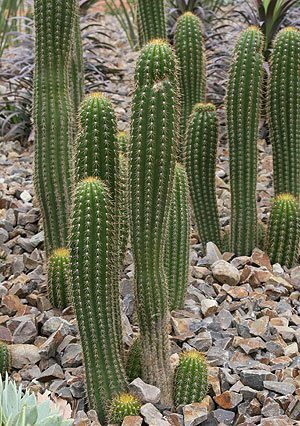 It also is known under different names, so what we know as C. spachianus is also known as Echinocereus spachianus, Trichocereus spachianus, C. santiaguensis and Trichocereus santiaguensis, a little confusing however that is taxonomy for you. This cactus species flowers at night with large sweet smelling trumpet shaped flowers. A really interesting species. However the flowers are not the only attraction. The tall spike of growth looks great in the right landscape setting. With such strong lines, they can be an architectural plant or design feature as well. These are a plant that are reasonably quick to establish themselves and have a columnar habit. As long as they have a well drained soil, a sunny open position and some protection from frosts they are an easy plant to grow. Growing conditions and Cereus care. Cereus require a well drained soil and a sunny position, good ventilation is also important. Remember not to over water.